Betty, a retail seller of miscellaneous goods, approached me at the networking meeting. Knowing I like animal prints, she was always on the lookout for the next leopard-zebra-furry gizmo to sell me. “I just got in these great leopard slippers—they’d look perfect on you!” she sang. “I’ll take them!” I sang back. Great transaction so far. Betty knew what I liked and looked out for me—I felt special and very well served as a customer. Then it went downhill. What a pity! A transaction that had begun happily and prosperously for all concerned ended with two people dissatisfied and thinking the other was being difficult. Upon reflection, I think we each thought we were doing the other a favor. She had taken time to look out for something I might like and the slippers were the result of her thoughtfulness. She expected more appreciation from me, and therefore thought that I would be glad to go out of my way to solve the delivery problem. I thought I was contributing to her prosperity by giving her an easy sale and expected her to take responsibility for delivery. The bottom line was neither of us was committed enough to the end result to be willing to be inconvenienced. We laughed about this later, and both acknowledged the importance of service, completion, and follow-though in every transaction, no matter how small. Every business depends on customer loyalty, satisfaction, and good will. Even the smallest thing can damage it. Preserve it at all costs. On May 26, I wrote about the leopard comforter I that I had bought on sale at Macy’s years ago. I held on to that leopard comforter for years. I got my full value out of it, I’ll tell you. But the day came when it was just a little too frayed around the edges, and its day was done. My roommate, Shelley, had searched for a comforter and not found anything she liked. But one afternoon a while ago, we were going through the shops in Old Town Temecula, and happened across a quilting store. Shelley saw many sample quilts around the store that she really liked, but none that were full-sized or for sale, because this was a store for quilting hobbyists. Shelley was undeterred. She found a quilt she liked and asked the woman at the desk if someone could make it for her. She was directed to Kerry Smith, who agreed to make her one to fit her bed. We had a great time pulling out pretty patterned fabrics and designing a beautiful patchwork of colors. Several weeks later, Shelley had a gorgeous new quilt, and I started thinking perhaps I would have one made for myself, too. So when Shelley, our friend Debby, and I went down to Pechanga, the Indian Casino in Temecula, we stopped by the quilt store again. 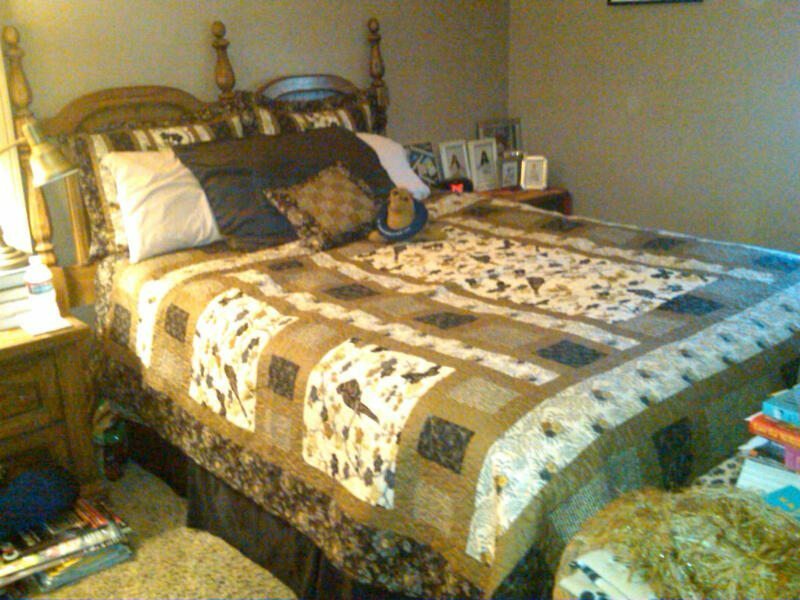 And there hanging on the wall, was a gorgeous quilt in blacks, browns, and golds with birds as the centerpiece. I fell in love. And as fate would have it, Kerry was there! After negotiating the price and choosing some gorgeous fabrics, I happily paid a deposit and waited breathlessly for my beautiful, hand-made, wonderful quilt and matching shams and pillow to arrive. It wasn’t long before I was cheerfully making up my new, beautiful bed! There’s something wonderful about saving up for a purchase and being filled with delightful anticipation when it’s about to arrive. Now I savor my beautiful new quilt that gives me great pleasure every time I see it. It’s a “pleasure purchase” – make sure to have some of these in your life – just for the joy it gives you! You deserve it!